A holiday favorite, this coffee rub prime rib with Certified Angus Beef ® brand is covered in a flavorful crust with a tender and juicy center. This sponsored post is in partnership with Sunday Supper, LLC and Certified Angus Beef ® brand. All thoughts and opinions expressed herein are my own and not influenced by either company and its affiliates in any way. 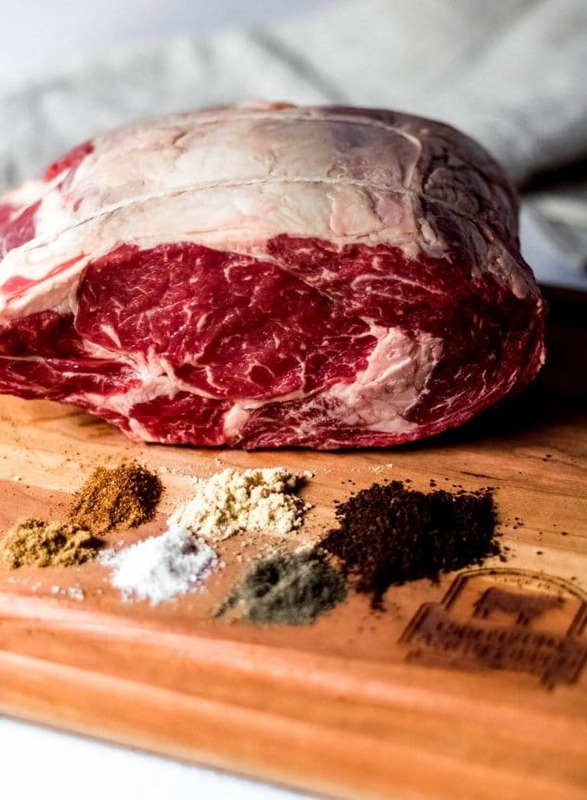 What is coffee rub prime rib? 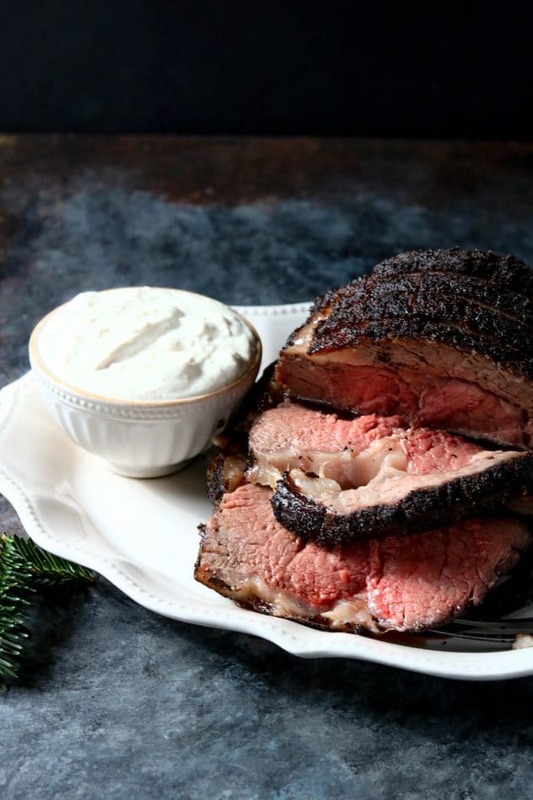 This coffee rub prime rib is the perfect centerpiece for your Christmas dinner. Traditionally, we were always a ham family for Christmas dinner, but I wanted to try out a prime rib this year because any excuse to eat prime rib is fine by me! I had my first coffee rub tri-tips this summer and they were so good that I thought man, I have to make my own coffee rub! That’s when I decided to marry the two; coffee rub + prime rib = heaven! Plus, I’m updating this recipe to include the use of Certified Angus Beef ® brand. There’s so much noise in the labeling industry these days, but Certified Angus Beef ® is a premium brand of beef I can stand behind. They have 10 exacting quality standards that all of their Angus beef must be judged against. It’s because of their values that I’ve partnered with them for all of my beef recipes here at Wanderlust and Wellness. How to make coffee rub? Yes, coffee rub actually has ground coffee plus several other spices! To make the coffee rub simply combine the following ingredients. Once combined, rub all over the outside of your prime rib, or any red meat, to get a nice crispy, flavorful crust. A holiday favorite, this coffee rub prime rib with Certified Angus Beef ® brand is covered in a flavorful crust with a tender and juicy center. If you like this recipe please give it a 5-star rating. Combine coffee rub ingredients into a small bowl and mix together. Rub the spice mixture heavily, all over the entire prime rib. 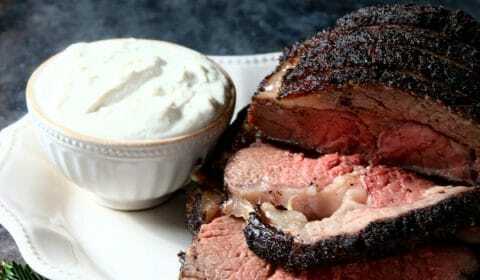 Place prime rib into a small roasting pan onto a roasting rack. You don’t want the prime rib sitting directly on the bottom of the pan. Place prime rib into the oven and cook at 450 degrees for 30 minutes. Combine the horseradish ingredients in a small bowl, stirring to combine, and place in the refrigerator until time to serve. Using a meat thermometer, check the internal temperature to ensure it’s cooked to the level you prefer. Typically medium rare = 130-135 degrees, medium = 135-140 degrees, medium well 140-150 degrees and well done 155+ degrees. Once the temperature has reached the desired level, remove prime rib from oven and let rest for 20-30 minutes. NOTE: the internal temperature will typically rise about 5 degrees as it rests, so keep that in mind when checking the temperature. Slice and serve with homemade horseradish sauce. Try these other coffee and beef recipes.